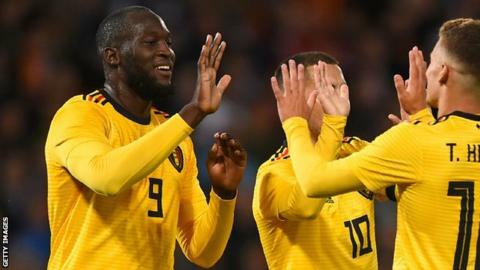 Eden Hazard and Romelu Lukaku scored the goals as Belgium got their Nations League campaign off to a winning start in Iceland. The Manchester United forward got on the scoresheet himself two minutes later with a close-range finish. He then added a third with a deft flick nine minutes from full-time. It was Belgium's first game in the new competition and ended a run of 13 competitive matches unbeaten at home for Iceland, who were hammered 6-0 by Switzerland away in their opening Nations League game on Saturday. Match ends, Iceland 0, Belgium 3. Second Half ends, Iceland 0, Belgium 3. Attempt missed. Dries Mertens (Belgium) left footed shot from the centre of the box is close, but misses to the left. Assisted by Thomas Meunier with a cross. Romelu Lukaku (Belgium) wins a free kick in the attacking half. Foul by Ragnar Sigurdsson (Iceland). Substitution, Belgium. Thorgan Hazard replaces Eden Hazard. Attempt missed. Runar Mar Sigurjonsson (Iceland) right footed shot from outside the box misses to the left following a corner. Corner, Iceland. Conceded by Thomas Meunier. Foul by Axel Witsel (Belgium). Foul by Nacer Chadli (Belgium). Sverrir Ingi Ingason (Iceland) wins a free kick in the defensive half. Foul by Eden Hazard (Belgium). Runar Mar Sigurjonsson (Iceland) wins a free kick on the right wing. Foul by Mousa Dembélé (Belgium). Birkir Bjarnason (Iceland) wins a free kick in the attacking half. Substitution, Iceland. Arnór Ingvi Traustason replaces Emil Hallfredsson. Goal! Iceland 0, Belgium 3. Romelu Lukaku (Belgium) left footed shot from the centre of the box to the bottom left corner. Assisted by Dries Mertens with a cross. Attempt blocked. Toby Alderweireld (Belgium) header from the centre of the box is blocked. Assisted by Dries Mertens with a cross. Substitution, Iceland. Victor Pálsson replaces Ari Freyr Skúlason. Substitution, Belgium. Mousa Dembélé replaces Youri Tielemans. Corner, Belgium. Conceded by Runar Mar Sigurjonsson. Attempt blocked. Romelu Lukaku (Belgium) right footed shot from the centre of the box is blocked. Assisted by Eden Hazard. Attempt blocked. Thomas Meunier (Belgium) right footed shot from the right side of the box is blocked. Assisted by Eden Hazard. Attempt missed. Thomas Meunier (Belgium) right footed shot from the right side of the box misses to the left. Assisted by Romelu Lukaku. Substitution, Iceland. Kolbeinn Sigthorsson replaces Jón Dadi Bödvarsson. Substitution, Belgium. Nacer Chadli replaces Yannick Carrasco. Romelu Lukaku (Belgium) wins a free kick in the defensive half. Foul by Sverrir Ingi Ingason (Iceland). Attempt saved. Gylfi Sigurdsson (Iceland) right footed shot from outside the box is saved in the top left corner. Assisted by Runar Mar Sigurjonsson. Attempt missed. Toby Alderweireld (Belgium) header from a difficult angle on the right is close, but misses the top right corner. Assisted by Dries Mertens with a cross following a corner. Corner, Belgium. Conceded by Sverrir Ingi Ingason. Attempt blocked. Yannick Carrasco (Belgium) right footed shot from the centre of the box is blocked. Assisted by Dries Mertens. Thomas Meunier (Belgium) hits the right post with a right footed shot from the right side of the box. Assisted by Romelu Lukaku. Eden Hazard (Belgium) wins a free kick in the defensive half. Foul by Hördur Magnússon (Iceland). Attempt missed. Jan Vertonghen (Belgium) left footed shot from outside the box is high and wide to the left. Assisted by Youri Tielemans. Attempt missed. Thomas Meunier (Belgium) right footed shot from the centre of the box misses to the right. Assisted by Yannick Carrasco. Corner, Belgium. Conceded by Ragnar Sigurdsson. Attempt missed. Romelu Lukaku (Belgium) header from the right side of the six yard box misses to the right. Assisted by Dries Mertens with a cross following a corner.